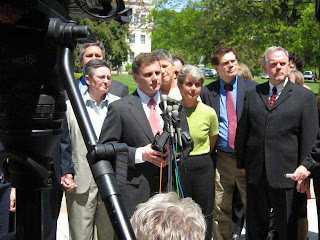 After yesterday's oral argument at the Connecticut Supreme Court, GLAD Attorney Ben Klein and the eight plaintiff couples in the case participated in a press conference on the courthouse steps. Ben opened by saying: "Today the plaintiffs argued for the right to the same treatment and dignity that all other families get. Under the Connecticut constitution, we believe that they are entitled to the same respect and dignity of any other couple." Lead plaintiffs Beth Kerrigan and Jody Mock then took the microphone to explain how important it is to them and their children to be able to say that they are married, and how heartened they were to hear one of the Justices bring up that point in court. "We have five year old boys in kindergarten, and they always ask us 'are you married?' And it breaks our heart to have to say the truth, which is that we're not. But we're fighting for that."